After the success of my fist giveaway, i decided to do another one, only much much bigger! – One of my favorite items from Strawberry Paisly is _______. – If I am the winner, you can reach me here: _______. 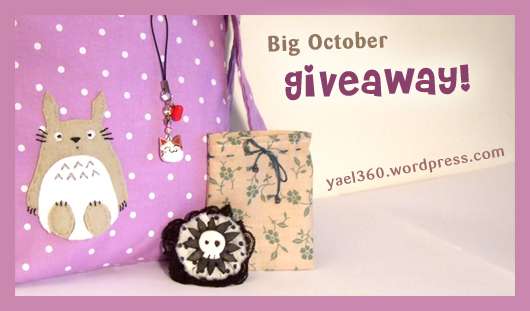 – Blogging about this giveaway (with a picture! ): 5 votes! So, for these to count as extras, please leave a separate comment for each additional entry. – I “like” Strawberry Paisly on Facebook! My facebook username is _______. – I shared this giveaway on my facebook wall! I included a link back to this page so that my friends can find it. Here is a link to the wall post: _______. – I tweeted about this giveaway on twitter. I included a link back to this page. Here is a link to the tweet: _______. – I blogged about this giveaway. I included a link back to this page and a picture of the giveaway. Here is a link to the post: _______. 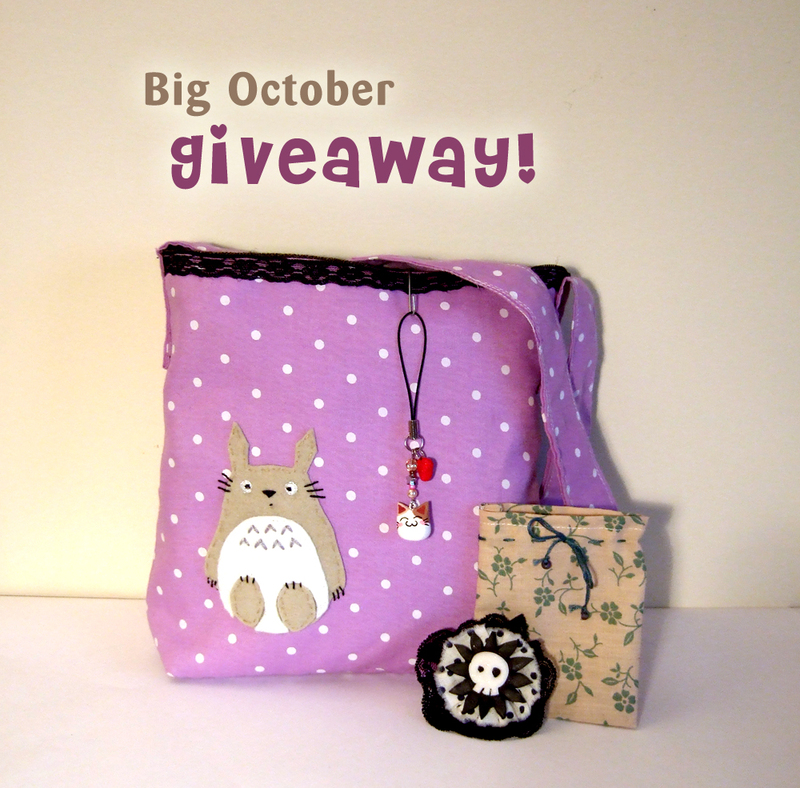 This entry was posted in Uncategorized and tagged bag, charm, charms, contest, cute, free, giveaway, giveaways, kawaii, purple, skull, studio ghibli, totoro by yael360. Bookmark the permalink. – I follow your blog, The username that I used to follow you is: kiddo. – One of my favorite items from Strawberry Paisly is the crazy cute emo/punk bunny bag. – If I am the winner, you can reach me here: kiddomsg at gmail dot com. I “like” Strawberry Paisly on Facebook! My facebook username is Suzanne Gregg. I shared this giveaway on my facebook wall! I included a link back to this page so that my friends can find it. Here is a link to the wall post: http://www.facebook.com/#!/kiddo47/posts/115197831875365. – I tweeted about this giveaway on twitter. I included a link back to this page. Here is a link to the tweet: http://twitter.com/#!/kiddo47/status/26830667197. – I follow your blog, The username that I used to follow you is: Uchihamew. – One of my favorite items from Strawberry Paisly is the Totoro: Under My Umbrella bag! – If I am the winner, you can reach me here: melissa.g_4ever@hotmail.com !!! I “like” Strawberry Paisly on Facebook! My facebook username is Melissa Gustavson. I follow your blog, The username that I used to follow you is: Uchihamew. One of my favorite items from Strawberry Paisly is the Totoro Under my Umbrella bag. – I “like” Strawberry Paisly on Facebook! My facebook username is Natalie Bogachov. – One of my favorite items from Strawberry Paisly is evil bunny plaid bag. – One of my favorite items from Strawberry Paisly is the kawaii kitty charms. I love cute kitties! I “like” Strawberry Paisly on Facebook! My facebook username is ladyjessica29. One of my favorite items from Strawberry Paisly is the Totoro umbrella bag that sold already. I also love the Pikachu bag! If I am the winner, you can reach me via Etsy here. – One of my favorite items from Strawberry Paisly is Simple everyday pearl beaded bead necklace. The last one didn’t link right. – One of my favorite items from Strawberry Paisly is the Cute Cheshire Cat charm. – If I am the winner, you can reach me here: daydreamer7333@yahoo.com . -I blogged about this giveaway. I included a link back to this page and a picture of the giveaway. Here is a link to the post: http://daydreamer73.deviantart.com/journal/35779609/ I couldn’t add a picture but I linked to the deviation and the contest banner you provided.